ISAIAH 55:8 KJV "For my thoughts [are] not your thoughts, neither [are] your ways my ways, saith the LORD." 5Behold, thou shalt call a nation that thou knowest not, and nations that knew not thee shall run unto thee because of the LORD thy God, and for the Holy One of Israel; for he hath glorified thee. 6Seek ye the LORD while he may be found, call ye upon him while he is near: 7Let the wicked forsake his way, and the unrighteous man his thoughts: and let him return unto the LORD, and he will have mercy upon him; and to our God, for he will abundantly pardon. 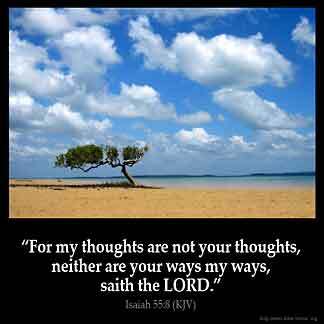 8For my thoughts are not your thoughts, neither are your ways my ways, saith the LORD. 9For as the heavens are higher than the earth, so are my ways higher than your ways, and my thoughts than your thoughts. 10For as the rain cometh down, and the snow from heaven, and returneth not thither, but watereth the earth, and maketh it bring forth and bud, that it may give seed to the sower, and bread to the eater: 11So shall my word be that goeth forth out of my mouth: it shall not return unto me void, but it shall accomplish that which I please, and it shall prosper in the thing whereto I sent it. � For my thoughts are not your thoughts, neither are your wayes my wayes, saith the Lord. "For My thoughts are not your thoughts, Nor are your ways My ways, declares the LORD." 55:8 For - If any man injure you, especially if he do it greatly and frequently, you are slow and backward to forgive him. But I am ready to forgive all penitents, how many, and great, and numberless soever their sins be. Because God is all, he is Omni. This can only let us as believers know that we will never be able to fully understand the true fullness of God. We are limited because that the way he intended for his children to be so that we will depend on him. God 's thoughts and ways are so much better and higher than my thoughts and ways. Truly His salvation is near and ready to take hold of . God has not held back any Good from me us , to those that walk uprightly. God 's ways and thoughts are perfect and calculated to give us the most needed outcome and not what we want and desire. I always think my way is best My thoughts are the best I found out different !!! When I turn myself to walk in God 's way and begin to think like Him then I will be prosperous and fat and flourishing. Blessed is the man that walketh not in the counsel of the ungodly . Yes !! Yes !! Yes !! Amen !! God takes the foolish things to confound the wise. God is an omnipotent God, who is the Creator of the heavens and of the earth. There is nothing that man, in his limited understanding and fickled ways, could ever do that would match God 's infinite wisdom and understanding. Instead, God wants people to humble themselves before His mighty hand and call on the name of Jesus. Trust in the Lord and have faith in Him knowing God will sustain the upright in heart. "And we know that all things work together for good to them that love God, to them who are the called according to his purpose." (Romans 8:28).